Hello Reader! Love you some Nicolas Cage? Horror Films? Um how about Nicolas Cage leading in a Horror film? Well that’s what we have here so check the news and trailer below. 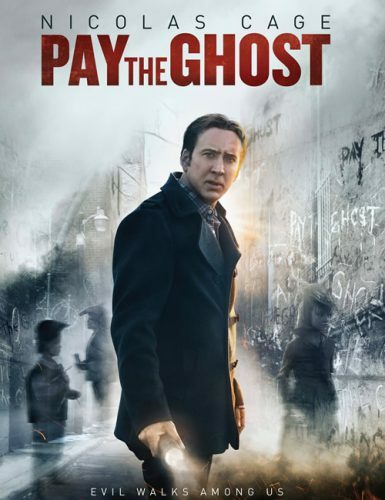 Pay The Ghost is Nicolas Cage’s next film. Can you believe that? From the trailer it doesn’t look like a scary movie but one with Some Horror elements and feels like a National Treasure and The Number 23 mash-up some what. I can see the acting will be good and I have a feeling the film might be a fun one. I’m in for a Blu-Ray Viewing. Check the trailer below and tells us your thoughts. Can you see yourself viewing this film? Plot: One year after Mike Lawford’s young son disappeared during a Halloween carnival, he is haunted by eerie images and terrifying messages he can’t explain. Together with his estranged wife, he will stop at nothing to unravel the mystery and find their son-and, in doing so, he unearths a legend that refuses to remain buried in the past.